Noah Howard Mickens (born February 18) is an American performance artist, showman, and writer from Portland, Oregon, primarily known for his contributions to vaudevillian revival, and as a ringmaster and master of Ceremonies for several theatrical circus troupes. 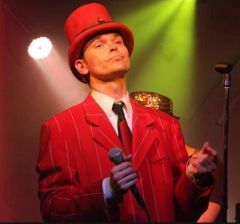 His stage persona, William Batty currently serves as the ringmaster of the Wanderlust Circus, as well as the emcee of numerous vaudevillian and bohemian events in the area. Mickens has worked in a variety of performance media: scrap-metal percussion, singing, butoh, drama, circus arts, rock opera, and fashion modeling. Several of his collaborative projects have been combinations of two or more of the aforementioned art forms. Mickens has also performed as composer, director, and producer of numerous theatrical productions, as well as show promoter and publicist for various venues in the Portland area, including Someday Lounge, Dante’s, The Jasmine Tree, and the Rotture-Branx venue complex.